Aside from the dedicated staff and actors of our recent production, Filipina...Bakit Ikaw?, its success would not be fully attainable without our event partners and also our special guests. National Broadcasting Network is the true largest TV channel in the Philippines, being the Filipino People's television, and backed by the entire machinery of government. Director Jesie Barandino and Publicity Head Michelle Rio guested last August 18 on The Morning Show to the play. Interviewed by Aljo Bendijo, the two elaborated on the significance of the play during these times. Bright Orb Multimedia Corporation. website designs, radio, news, videos, social site all in one. Slick9 did our photoshoot and edited our photos. They covered the second run and also edited the videos. event coverage, online promotions, and viral campaigns. Mr. Jeman Villanueva has been dedicatingly editing and publishing the articles we give out during the 2nd and 3rd run. Though he was not able to watch the play, Ms. Marjorie Pineda also from Orange Magazine TV came to watch it. For over 30 years now, DZME has chronicled the Filipino’s passion for good life and their aspirations for good government, In 2009, DZME has moved into its new studios at the Victory Mall in Caloocan City from its old base in Roosevelt Avenue, Quezon City as part of its plan to expand operations. Technical Director Marcel Javier and Publicity Head Michelle Rio guested last August 17 on Showbiz na Showbiz to promote the 2nd run of the play. Alex Datu the host, watched the play on August 20 which was even his birthday. Michelle Rio came back on September 7 to promote the third run and Mr. Alex Datu gave a post-event review of the play. The Philippine Starweek is the Sunday Magazine of the Philippine Star. Filipina...Bakit Ikaw? has been featured twice in the Theatre section of Sunday to Sunday - Around Town in Eight Days. Shown every Sunday at 10:30-11 AM ON NBN 4 featuring the tourism of Batangas. Beautiful Batangas sponsored the 2nd production's food for cast and staff. The Hip hop in Her (TheHinH) is an online hip hop journal covering lifestyle, culture, and news/politics. Created by Monique Jaramillo-Seneres (7 Shots/Locked Down Ent/Dope Love Records), who considers writing one of her first and lasting passions, she felt it was long overdue for her to pursue a project like this. 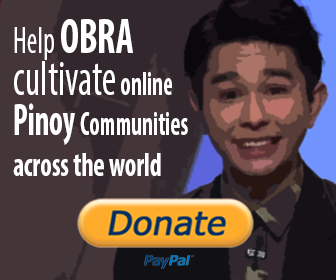 In behalf of OBRA Inc., we truly appreciate your presence on our show. 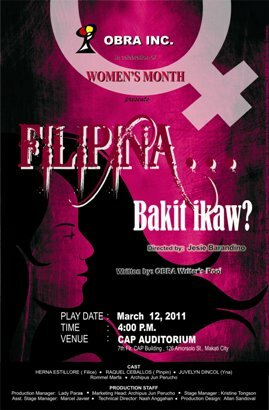 Please support again our next production. More coming up! Keep it here at http://www.obra.ph. For inquiries on other events that OBRA Inc. handles, e-mail us at obraincorporated@gmail.com or contact Mitch at 0918-5123600. We would love to hear from you!